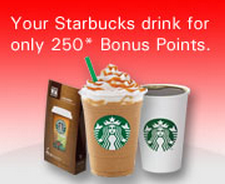 HSBC Starbucks Rewards Promo ~ Philippine Freebies, Promos, Contests and MORE! If shopping and coffee are 2 things you just can't get enough of, then you should probably join HSBC Starbucks Rewards promo. Spend at least P2,500 and earn through bonus points to redeem a tall Starbucks handcrafted beverage. You can use only one (1) charge slip issued by a merchant on a given day with up to twenty (20) redemptions for the entire promo and redemption period. If you want more, you can still redeem above that number, only within bonus points deduction conditions. In addition, you can choose to upsize your drink for only P15-P30. Remember, only bonus points earned from your new spend is eligible for a Starbucks beverage. Existing bonus points may not be used.